The fourth cap in a series of caps commemorating the Águilas de Mexicali’s 70th anniversary comes from the team’s second LMP championship and remixes a now-common theme in baseball into a nod to the past. Just a few years removed from their first Liga Mexicana Pacifico (Mexican Pacific League) and Serie del Caribe (Caribbean Series) championships, the Águilas de Mexicali found success again and captured their second LMP crown during the 1988-89 season behind manager Dave Machemer, former MLB player and longtime MiLB manager. The team would go on to represent Mexico in the Serie del Caribe but would fall short in repeating their prior success some four years before. Most notable for the Águilas was the performance of left-handed starting pitcher Mercedes Esquer on the season. He would go on to be the first and only pitcher in the history of the LMP to seize the pitching “triple crown” with a record of 13-3, a 2.09 ERA and 110 strikeouts. Esquer would also throw 7 shutouts on the season, helping lead the Águilas de Mexicali to a 85-35 total record. Also notable during the 1988-89 LMP season was the 31st no-hitter in league history being thrown by Curt Schilling of the Naranjeros de Hermosillo. In an interesting parallel that brings us back to the modern LMP, the 1988-89 season would be the first with a contracted league; the Potros de Tijuana (Tijuana Colts) and Algodoneros de Guasuave (Guasuave Cotton Farmers, roughly) ceased play prior to the season and the LMP contracted to 8 teams with a point system in place to determine playoff teams. Just announced a week before this writing is the reintroduction of the Algodoneros de Guasuave and Sultanes de Monterrey (Monterrey Sultans) to the LMP, bringing the league back to 10 teams in time for the 2019-2020 season. A simplified look for this cap belies an interesting detail found under the brim. A hat-related note worth mentioning is the color of the cap; this is known technically as light navy. The same color fabric is used by the San Diego Padres and other teams. 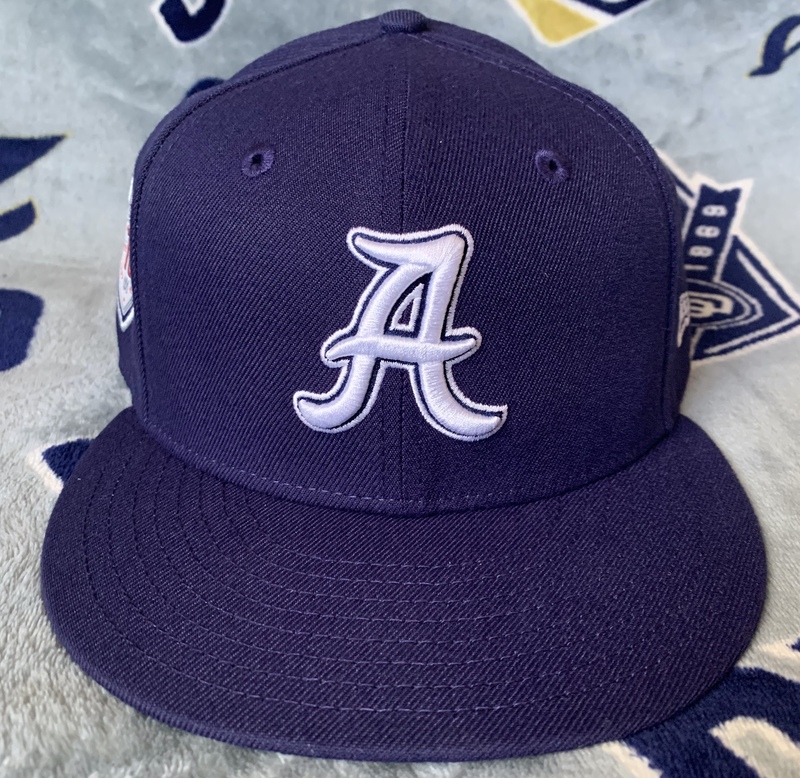 The Águilas alternate between use of light navy and true navy on their caps. I’m unsure of the reason why. Here’s a better look at the A logo. I can’t place when the Águilas may have used this particular script A, but it’s a cool look nonetheless. As with the rest of the caps in this series, the 70th anniversary patch is found on the wearer’s right. The rear of the cap features the modern LMP logo. Here’s the pop of detail! The underbrim is done in blue digital camouflage; this is meant to match the jersey worn with the cap. The Águilas decided to mix the commemoration of the 1988 squad in with a now-annual salute to their military, a common practice also found in MLB. This digital pattern is apparently worn by the Northwest Zone of the Mexican military. The black sweatband also features the added detail of the year the cap is meant to commemorate stitched on the sweatband. 1988 is a very good year. With the season over as of this writing, this particular cap will become more scarce as stock sells through. You’ll have to cross the border and visit El Nido in order to get your hands on one, in any case.